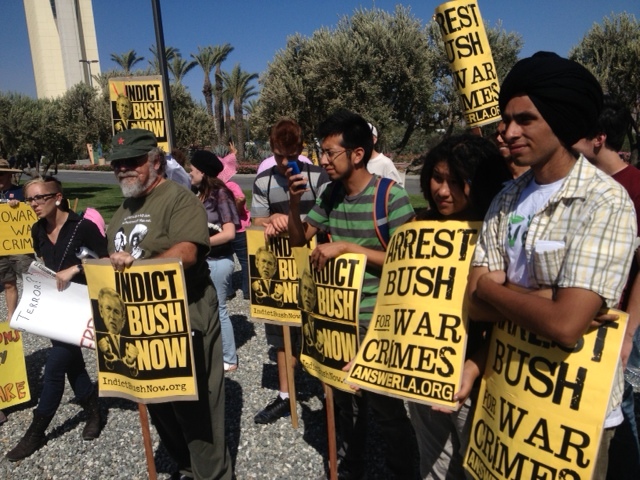 Protestors gathered outside the Casino Morongo in Riverside, Calif., to protest the presence of war criminal and former President George W. Bush. Bush was paid a huge sum of money to speak at a “leadership conference” of mostly local officials. ANSWER LA, Occupy Riverside, Occupy Coachella Valley, Riverside Area Peace & Justice Action (RAPJA), March Forward!, IndictBushNow.org and other groups mobilized for the protest. Speakers addressed the crowd, primarily focusing on the imperialist wars launched by the Bush administration and the attacks on civil liberties initiated as a part of the so-called war on terror. The outright slaughter of over 1 million Iraqis as a part of the invasion and occupation of that country was mentioned by several speakers as his most infamous crime. Protestors with IndictBushNow.org demanded that formal charges be brought against the former President so that he can finally be held accountable, a demand that was echoed by many present at the demonstration. There was a strong understanding that these policies were not only continued by the Obama administration, but in some cases intensified. Protestors expressed a high level of awareness of the recent leaks regarding the massive NSA surveillance program called PRISM. The demonstration in Riverside, Calif., was one protest in a long line of actions to show George W. Bush that we will never forget or forgive his terrible crimes against the people of the world.